Boreal Forest Dynamics and Biodiversity Research group | Boreal Forest Dynamics and Biodiversity Research Group (BoForDyn) carries out fundamental research on the structure, dynamics and biodiversity of boreal forest ecosystems. We conduct research that increases our understanding of boreal forest ecology and the use of this knowledge in developing methods of restoration and sustainable ecosystem-based management of the boreal forest. Boreal Forest Dynamics and Biodiversity Research Group (BoForDyn) carries out fundamental research on the structure, dynamics and biodiversity of boreal forest ecosystems. We conduct research that increases our understanding of boreal forest ecology and the use of this knowledge in developing methods of restoration and sustainable ecosystem-based management of the boreal forest. Research on unmanaged forests provides understanding of the structure, dynamics and ecology of natural forest ecosystems. This understanding can be utilized for planning sustainable forest management, conservation measures, or for assessing human impact on forests. Natural disturbance dynamics can be used as a model in forest management, for example in the planning of restoration activities or commercial forest cuttings. 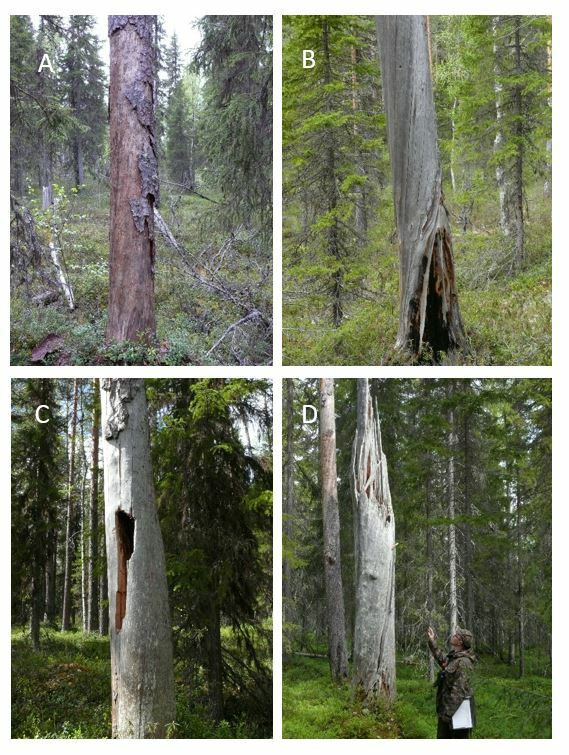 In this study, we quantified and analyzed the disturbance history of four different forest stands in southern boreal forests of Russian Karelia. Our aims were to determine the disturbance frequency, intensity and range in different spatial scales, and to explore the connection between disturbance quality and forest characteristics. We used standard dendroecological methods (i.e. tree-rings) to record growth releases and gap recruitment from individual trees, indicating past disturbance. With this information, we reconstructed a disturbance chronology for each stand over the past two or three centuries. Two of the studied forest sites were spruce-dominated and one pine-dominated stand. One stand represented mixed-forests with quite an even mix of pine, larch, spruce and birch trees. The age structure of the forests was uneven-aged in three of the sites. The fourth site was an exception, characterized by dominance of Scots pine, and relatively even-aged trees (80-100 years). 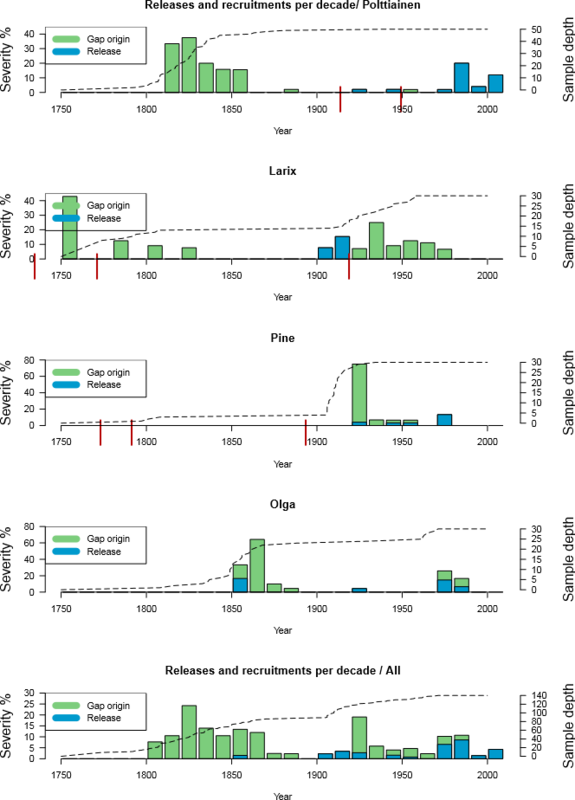 The disturbance chronologies showed significant variation in spatial and temporal scales between sites and sample plots. During the last 2-3 centuries, all the sites had low (0-20%) to moderate (20-40%) or low to high severity (>40%) disturbances (Fig.). All the sites had gone through a stand-scale disturbance (i.e. disturbance recorded throughout the stand), but no evidence on regional scale disturbance was found. We found no clear connection between forest characteristics and disturbance quality, albeit the data may have been too small to detect any strong interdependence. The disturbance dynamics in the forests studied showed remarkable variability in disturbance frequency, intensity, and range. The results emphasize the natural heterogeneity and variance related to forest structure, composition and disturbance history. While these results back up the prior understanding of the disturbance regime in the Karelian region, they also give us a better possibility to reflect the changing future conditions and address the important questions for upcoming research. For example, if the past natural disturbance dynamics has been more driven by local conditions and events than regional climate conditions, will this remain with the ongoing climate change? And to what extent, is it possible (or desirable), to preserve the variable natural disturbance dynamics and characteristics of forests along with the diminishing natural forest area and increasing human impact? Fig. Disturbance chronologies on a decadal scale. First, all four sites separately and then pooled together. In the x-axis years and in the (left) y-axis % of trees indicating a release or a gap recruitment. The sample size contributing to the chronology is shown as a dashed line with corresponding values on the right y-axis. The chronologies are truncated after sample size drops below 5 in individual sites and 10 in the pooled chronology. Red vertical lines represent the dated fire scar years from the site in question. The spatial variability of forest structure (for example, tree sizes, distribution of stems and foliage, dead wood) is the result of multiple factors such as disturbances, succession, topography, and soil properties. However, the explicit scales at which these variation patterns occur are often described only qualitatively. We studied three 2 km × 2 km landscapes in northeastern Finland and two in eastern Canada. We estimated canopy cover in contiguous 0.1-ha cells from aerial photographs and used scale-derivative analysis to identify characteristic scales of variation in the canopy cover data. We analyzed the patterns of variation at these scales using Bayesian scale space analysis. We identified structural variation at three spatial scales in each landscape. Among landscapes, the largest scale of variation showed the greatest variability (20.1–321.4 ha), related to topography, soil variability, and long-term disturbance history. Superimposed on this large-scale variation, forest structure varied at similar scales (1.3–2.8 ha) in all landscapes. This variation correlated with recent disturbances, soil variability, and topographic position. We also detected intense variation at the smallest scale analyzed (0.1 ha, grain of our data), partly driven by recent disturbances. Except for the large-scale variation, the identified scales were remarkably similar among the landscapes. This suggests that boreal forests may display characteristic scales of variation that occur somewhat independent of the tree species characteristics or the disturbance regime. The study is published in Ecosystems, and lives here. In the boreal zone the major drivers of change of forest age class distributions and structures include the use of clearcut short-rotation harvesting, more frequent and severe natural disturbances due to climate warming in certain regions. The decline in old forest area, and increase in managed young forest lacking natural post-disturbance structural legacies, represent a major transformation in the ecological conditions of the boreal forest beyond historical limits of variability. This may introduce a threat to biodiversity, ecosystem resilience and long-term adaptive capacity of the forest ecosystem. All the members of our group are sharing the highlights of our current research in the ECCB congress, starting next Tuesday, 12.6.2018 in Jyväskylä. In the congress, our sessions are at Tuesday (poster, Juni and Niko, Forest Management and Biodiversity session), Wednesdey (talk by Tuomas, Ecological processes in forest ecosystems session), Thursday (talk by Timo, Natural disturbance emulation in forest conservation and sustainable ecosystem management session, also co-chaired by Timo), and Friday (talk by Niko, Forest Management and Biodiversity II session). Tuomas also chairs the “Human-Wildlife conflicts” session at Wednesday. Come to meet us and share your ideas! Forest fires were historically the most impor­tant disturbance agent in the northern European boreal forest, but have virtually disappeared in the 20th century. However, past fires have left persistent legacies in forest structure and, due to their strong influence on forest age structures, continue influencing forest dynamics long since their disappearance. It is hence clear that we need knowledge on past fire occurrence, to be able to attribute the changes we observe in the forest to their drivers. We reconstructed past fires in three northern boreal landscapes (each 2 km x 2 km) in Värriö and Maltio strict nature reserves in northeastern Finland. 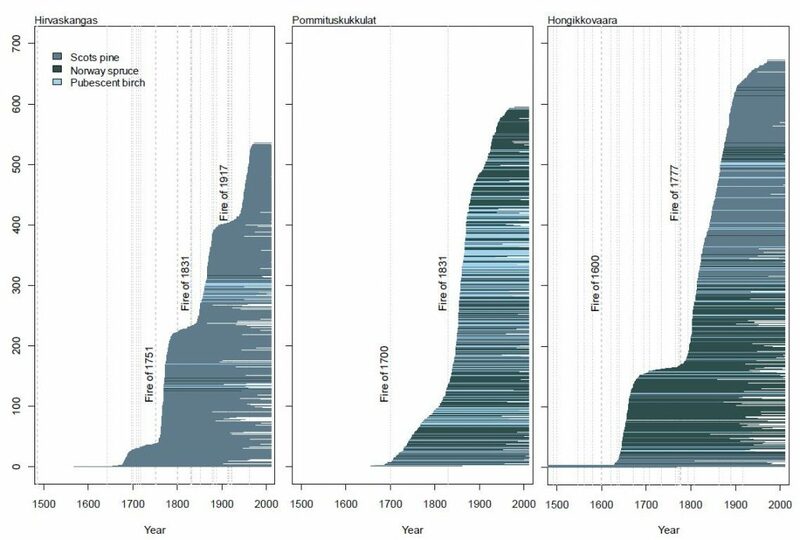 For the reconstructions, we used dendrochronological methods (i.e., methods based on tree ring widths), and described the occurrence of fires in the past 300 years. For these three landscapes, the average fire cycles (a measure of fire activity) were 72 and 156 years in Scots pine-dominated landscapes, and 579 years in a Norway spruce-dominated land­scape. The numbers of fires during the past three centuries were clearly related with soil properties: forests on soils that retain water better had experienced fewer fires than forests on coarser soils with lower water holding capacity. Tree age structures that we determined from 1800 live and dead trees showed strong age cohorts that were associated with large fires in two of the landscapes. The y-axis shows the cumulative number of trees – each horizontal line represents the life span of an individual tree. Years indicated fires that influenced most parts of the study landscape. It is noteworthy that although tree growth and regeneration in these northern regions are considered highly climate-sensitive, fires have been a major driver of forest dynamics in these areas. It is also clear that the continued absence of fires will lead to considerable changes in the forest structure and species composition in the future, even if the reserves are strictly protected from direct human influence. The study is published in Boreal Environment Research, and can be found here. 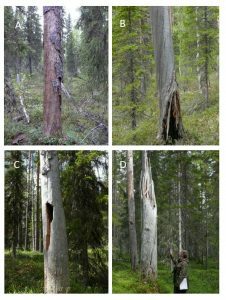 We examined and mapped the amount, structural features, site characteristics and spatial distribution of dead standing pine trees over a ten hectare area in an unmanaged boreal forest landscape in the Kalevala National Park in Russian Viena Karelia. After their death, Scots pine trees can remain standing for decades and sometimes up to 200 years, forming long-lasting and ecologically important structures in boreal forest landscapes. Standing dead pines decay very slowly and with time develop into ‘kelo’ trees, which are characterized by hard wood with silvery-colored appearance. These kelo trees represent an ecologically important, long lasting and visually striking element of the structure of natural pine-dominated forests in boreal Fennoscandia that is nowadays virtually absent from managed forest landscapes. See study here. Above: Examples of different kelo structures contributing to forest structural and substrate diversity. (a) A fairly recently died partly debarked tree (often fall of bark is accelerated by woodpecker foraging). (b) Old kelo tree with fire scarring and charred wood in the trunk base. (c) A kelo with a cavity. The tree was made hollow by the Boreal Carpenter Ant (Camponotus herculeanus). (d) A large hollow broken kelo tree; such hollow broken trees are used for nesting by e.g. the Great Grey Owl. Photographs by Timo Kuuluvainen. By compiling all available tree ring based fire history reconstructions, and a set of temperature and precipitation reconstructions, we analyzed how climate had influenced the occurrence of forest fires in Finland and the adjacent regions in western Russia. 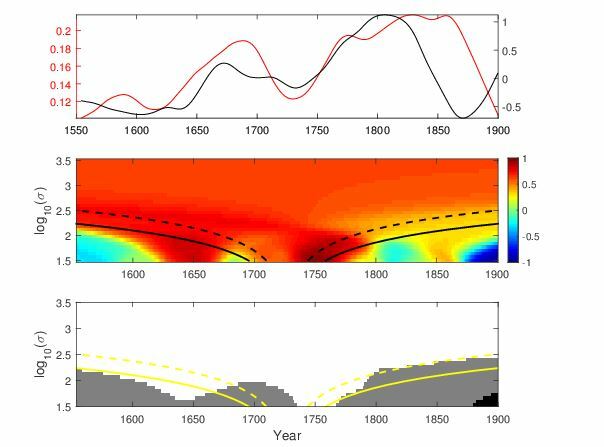 Our analyses were based on Bayesian scale-space methods, that made it possible to assess these fire-climate linkages over different time scales. In the analyses, we saw the well-documented relationship between fires and weather conditions during individual summers (high fire activity was related to dry summers). 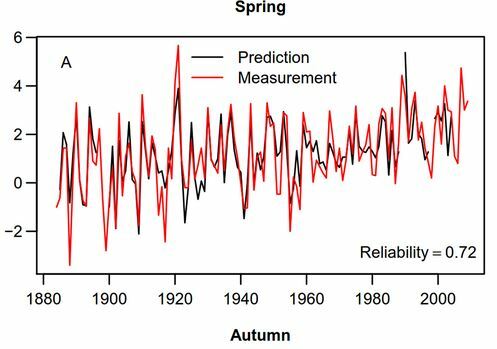 However, and somewhat surprisingly, fires and climate (summer temperature, and especially summer precipitation) were also very clearly related to one another at longer, approximately decadal, time scales. The result of this work, as a collaboration between our group, Department of Geosciences and Geography of University of Helsinki, and the Department of Mathematical Sciences at the University of Oulu, is now available in Ecological Monographs. Historically, the synchrony of fire occurrence in different parts of the region was related to drought. In a joint study with several research groups at the University of Helsinki and Aalto University, we compiled a collection of records on different biological and physical phenomena, to assess their reliability as an indicator of past temperatures for different seasons. This collection included different characteristics of tree rings, and plant and ice phenology. Our assessment showed how different combinations of these temperature indicators provided reliable information on the temperatures of all four seasons, as well as annual temperatures. See the full paper in Plos one. The paper reviews the current understanding and ideas of ecosystem management when applied to the boreal forest. Declines in managed forest biodiversity and structural complexity, combined with rapidly changing climatic conditions, can pose a risk to forest health and long-term provisioning of important ecosystem goods and services. 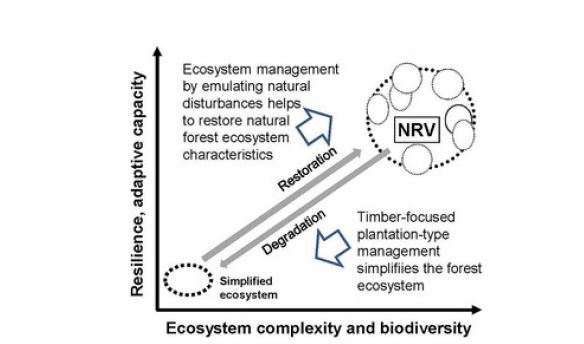 I concluded that ecosystem management in the boreal forest calls for a transition from plantation-type forestry towards more diversified management inspired by natural forest structure and dynamics. Taper curves (i.e., functions describing the shape of a tree stem) can be used for conveniently computing the volume of a tree stem, using volume integrals, but they are not very commonly used in ecological research. The curves and their volume integrals are particularly convenient for computing the volume of snapped trees, where the shape of the stem (taper) is determined by the tree diameter and the height of the tree before snapping, and the volume is computed from the base of the tree to the snapping height (or any other point along the stem). Same functions can be used to compute the volume of a fallen part of a snapped tree just as easily. We’ve written an easy-to-use R-script for several tree species in regions we are working in, based on previously published taper curves: Scots pine, Norway spruce, and birch in Finland, as well as black spruce and balsam fir in Quebec, Canada. Take a look at the script here.